Frauds and scams are a dishonest scheme where you are tricked out of something, usually money. Many people are hoodwinked by scams, so don’t be embarrassed about getting help if you think you have been. Online fraud: fraudsters use the internet to commit their crimes. Identity theft and identity fraud: your personal details are stolen then used in a fraud. Doorstep fraud: bogus tradesmen, police or officials and door-to-door sales people try to scam you after knocking at your door. Letter fraud: an advance-fee scam where you are asked to send money or help transfer money to somebody. Phone fraud: fraudsters pretend to be bank employees, police or officials to get your valuable personal details, such as usernames and passwords. We’re all different but feeling embarrassed, ashamed, worried, isolated, scared are angry are all perfectly normal. How can I help protect myself from fraud? Do not give any personal information (name, address, bank details, email or phone number) to any individual or organisation, until you have proof that they are who they say they are. Many frauds start with an email. Remember that banks and financial institutions will never email you asking you to confirm your account details or click on a link. Do not trust any emails that do, even if they look genuine. If unsure, you can always check by calling your bank on the phone number on one of its genuine letters or website (always type directly into the address bar), or in the phone book. Identity fraudsters don’t need much information to clone your identity, so destroy (preferably shred) receipts with your card details on and letters with your name and address. Make sure your computer has up-to-date anti-virus software and a firewall. Always keep your browser set to the highest security levels to prevent malware and computer crimes. Sign-up to the Visa Verified scheme or MasterCard’s Secure Code whenever they are offered while shopping online. Here, you register a password with your card company, which increases security on online purchases with participating retailers. Be extremely suspicious of post, phone calls or emails that offer you business deals out of the blue. If something seems too good to be true, it probably is. Always question it. 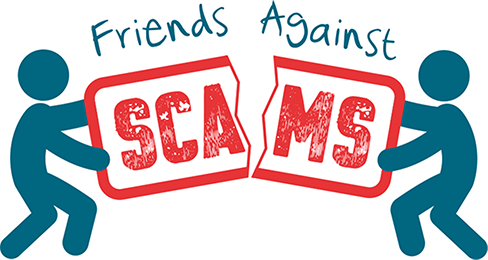 Supporting Victims have registered as a friends against scams organisation and include the logo and link to website. Should I contact my bank if I think I’ve been financially scammed or defrauded? If you suspect you have been financially scammed or defrauded, we advise if possible, that you should contact your bank to discuss the matter with them. Will I get my money refunded by my bank? This can depend on the type of fraud and when it happened. Which? has more information on your consumer and banking rights. What should I check for when people come to my door? If someone comes to your door, ask to see their identification. You do not have to let them in, and they must leave if you ask them to. Carry out a web search on the business to see if there are other consumers who have commented on the quality of their work – many scams can be identified this way. ActionFraud have more information about door-to-door salesman, including how to spot bogus tradesmen and who to contact if you fall victim to them.